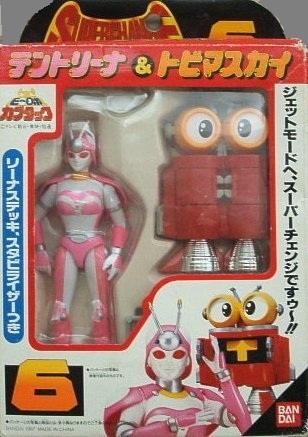 She's Fantastic: B-Robo Kabutack's TENTORINA! Happy Valentine's Day! I've been saving Tentorina for this day all year (since she's my favorite of all my pink toys). B-Robo Kabutack is the 16th installment of Toei's Metal Hero Series. The Metal Hero Series had a similar role in Japanese popular culture as other serials like Super Sentai (aka Power Rangers) or Kamen Rider (aka Masked Rider). These series usually reinvent themselves every year while sticking to a general theme, The Metal Hero Series typically involved robots or heroes in robotic suits who combat evil technology with good technology. Often the storylines involve "space police"-type genres. 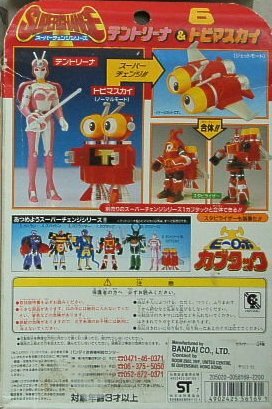 B-Robo Kabutack is unique in that it's the first in the series to be totally geared towards children. The basic plot involves a scientist who creates a bunch of robots to help him find these magic "star pieces" scattered across the planet. Some of the robots had incomplete programing and start being bad. Tentorina is a pink humanoid robot (on the good side) who is styled after a ladybug. I love her design. One of my favorite fembots ever. Let's check her out below! 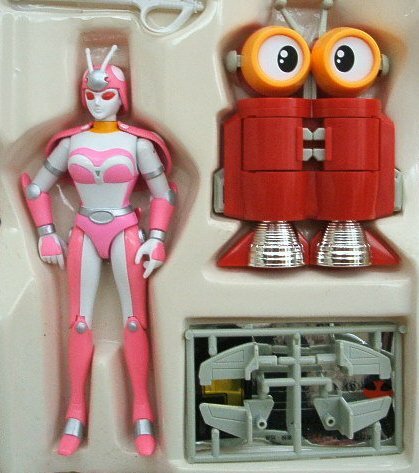 She comes packaged with Tobimasky, another friendly robot who can transform into a jet. Love the zany looking characters from these shows.